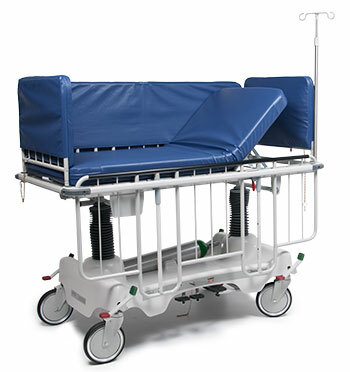 Stretcher series intended for transport, examination, and care of pediatric-age patients in healthcare facilities. Provides the safety and security of 360 patient protection, as well as 360 patient access when needed. The three position vertical side rails are easy to use and provide maximum patient security. The dual pedestal design provides maximum stability for patient transport, treatment, and recovery.